“There’s plenty to it, so go right to it, and once you do it, you do it again. The folks uptown gave up skitin’ and scatin’. The real lowdown is they’re all goin’ Latin.” It’s the Cab Calloway song, “That’s one thing I found when I looked up congo-conga. To tell the truth, I don’t think I had ever heard of the song until I went looking for it. And the anagram today comes from the lyrics, to a point. The last sentence was not anagrammed, so using the words, There’s plenty to it, so go right to it, and once you do it, you do it again. The folks uptown gave up skitin’ and scatin’ it reads, “It took thought to identify words in language. I don’t suppose you have day to go talk to St. Peter’s in Cincinnati?” Hmmm, well I suppose if it is important, I could do that. But it may be different than the way you’d think. This collage is a little different than my normal. I know how could one tell, but it is VERY different. Some friends have been removing interior walls and flooring in the house they are working on, so some of their refuse comes here, mainly lath which is cut and stacked to be burned for heat this winter. There was one small piece of the of linoleum that made it into the yard, and has been on a table a week or so. I worked in the yard a little today and I brought it into the house because of a connection I could see. 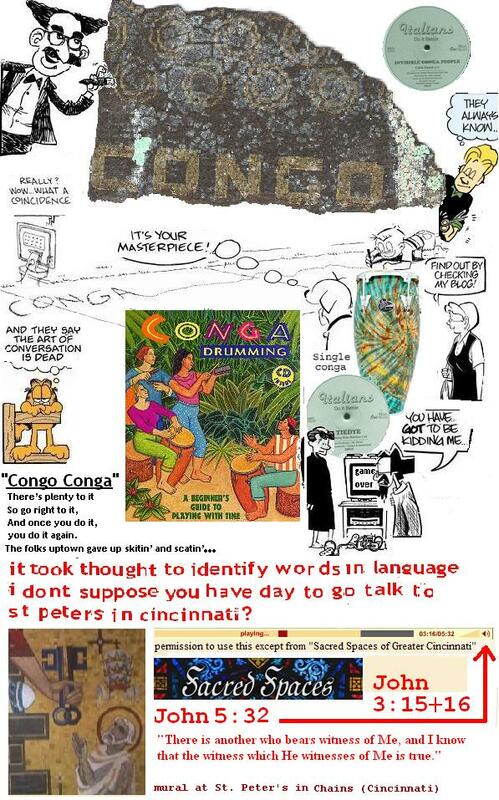 If you do that power of 10 thing from outer space, you probably can read the word on it…congO, and yes, congA is what is written on the sidewalk in the Red & Rover comic. O…A…hmmm…A…O…Oh….Alpha Omega. Ya think? Congo is a place and a dance, among other things. Conga would be the feminine of congo, if you are so inclined. But to me, it means something more. It is a prompt, which for most people would be a stretch. So I put the piece of congoleum through the copy machine and went about my collage. There was only one small piece, but it was enough for me to see, and maybe someone else. 😉 Maybe you will see how I made the connections. CONGO-CONGA, invisible congo people, Italians, tie dye, “playing with time”, and when I went to the St. Peter in Chains site I found a reason to stop the video at 3:15-3:16 and decided that meant to make the next connection, which I got as John 5:32, which was also the number on the video stop-point where the words spoken also meant something to me. Small coincidences…I call them God incidences. The real low down is they’re all goin’ Latin. This entry was posted in anagrams, coincidence, Spiritual, synchronicity and tagged anagrams, belief, coincidence, connections, conversation, interpretation, John 5:32, listening, random, Spiritual, synchronicity, thoughts. Bookmark the permalink.